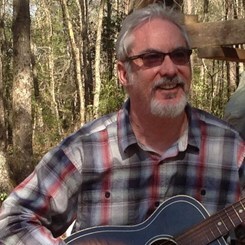 John Fonvielle: John has been playing guitar for over 40 years as well as bass and mandolin. He is a gigging musician and plays in many styles including bluegrass, country, rock and roll, funk and punk. He also produces a radio show for public radio. John loves sharing his passion for music from the novice to the more experienced player.